What do you get when you take one perfect Addition Elle Spring piece and give it to three women? You get 3 completely different looks that show diversity in fashion! I love the fact that fashion is so personal and can be interpreted in a variety of ways. I appreciate how this gorgeously minimal jumpsuit from Michel Studio is used to put together three drastically different looks on three different body types, acting as a blank canvas for everyone to play with. This speaks to the fact that everyBODY has the right to wear whatever they want because style is an embodiment of how you utilize pieces, not necessarily the piece itself! 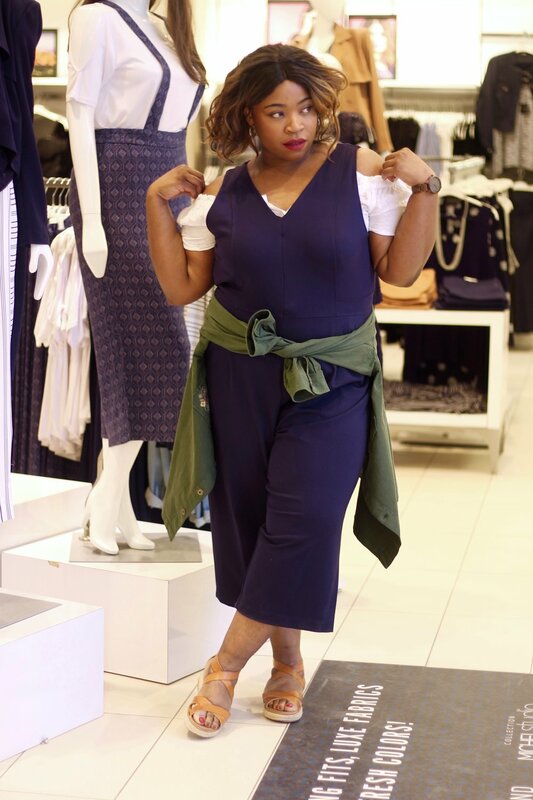 Before I dive into how each of us styled our looks, I have to say that if you do not already own this jumpsuit, you need to stop what you are doing and head to the closest Addition Elle store.. now! This has to be one of the few universally flattering pieces I have come across in a long time. From the lightweight fabric to the fit-and-flare inspired silhouette, this jumpsuit hugs all our curves unapologetically. 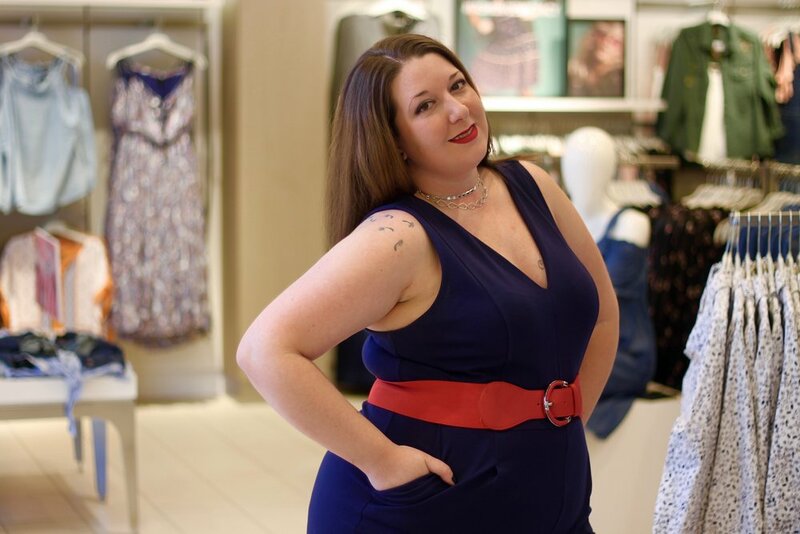 In my images, I am wearing my true size (size 20 and I am 5’9), however, I could easily have sized down for a more body-con look. This excites me to no end because that means I can choose what fit I want in order to create a different look each time! I would highly recommend you size down for a more tailored, waist defining, Beyoncé booty inspired look (aka freakum dress vibes); however, I decided to keep this jumpsuit on the more flowy side because it added to the festival look I was going for. My initial inclination when I first saw this jumpsuit was to dress it up with a fitted blazer vest and stiletto heels, but I ultimately decided to take this jumpsuit the other way. I waned to prove that a formal piece like this has the ability to be used in more casual settings. Adding an off the shoulder, ruffle sleeved blouse under the jumpsuit still lets the shape of the jumpsuit shine through while also adding a boho casual touch. I played with the idea of adding a belt, but decided to accentuate my waist by tying a floral embroidered military jacket around my hips instead. Paired with a pair of platform sandals, this look takes me straight to Coachella evenings! 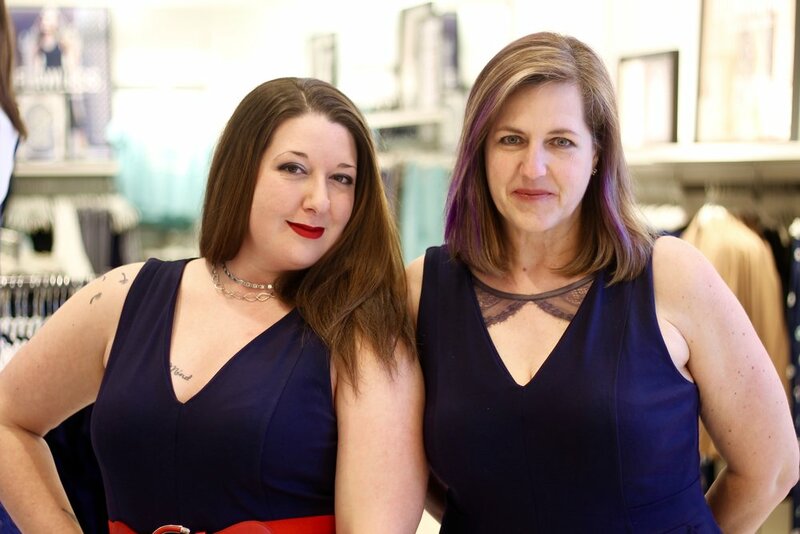 Next up, read about how Lynn and Kimberly, wonderful YYC babes that work at Addition Elle, put their personal style forward in their looks! It's not hard to style this amazing Michel Studio jumpsuit from Addition Elle in so many ways! It's already has such a nautical feel to it, so I played off that by adding red accents. Wide red belt to accentuate the waist, red pumps to show off the cropped leg, and a bangin' red lip. Added a silver choker as I'm obsessed with chokers lately. The second look with the Love and legend floral white denim jacket would be my more casual, weekend look. (Because the jumper is that comfy!) I would add a white ked or converse shoe to finish it off. I chose the white denim and white shoes for the nautical feeling and because I love the contrast against the navy. I picked the Ashley Graham grey lace bra as it gave a really pretty and delicate touch to the neckline. I'm a strong believer in incorporating beautiful lingerie into fashion, not just covering it up, and so many of AG's pieces allow us to do just that. And I chose the scarf as this cropped one piece has a real retro feel to it and the scarf ties into that look for me. So there it is! 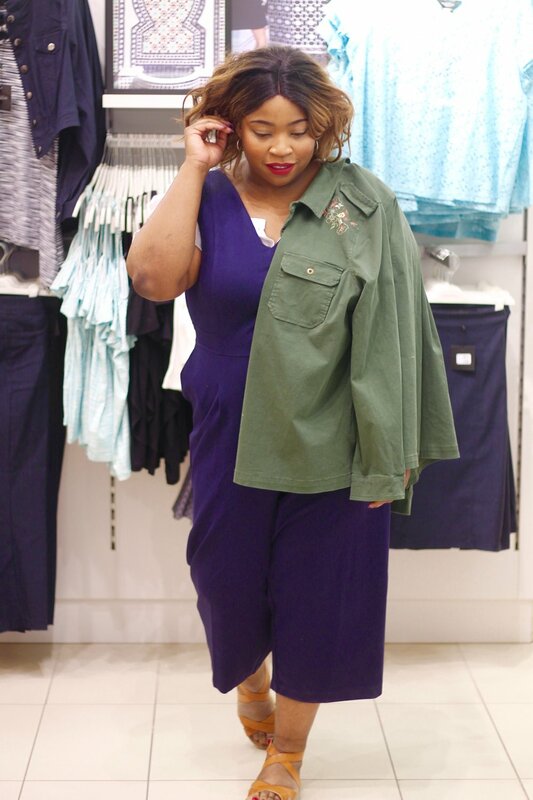 Three completely different looks styled using one jumpsuit! 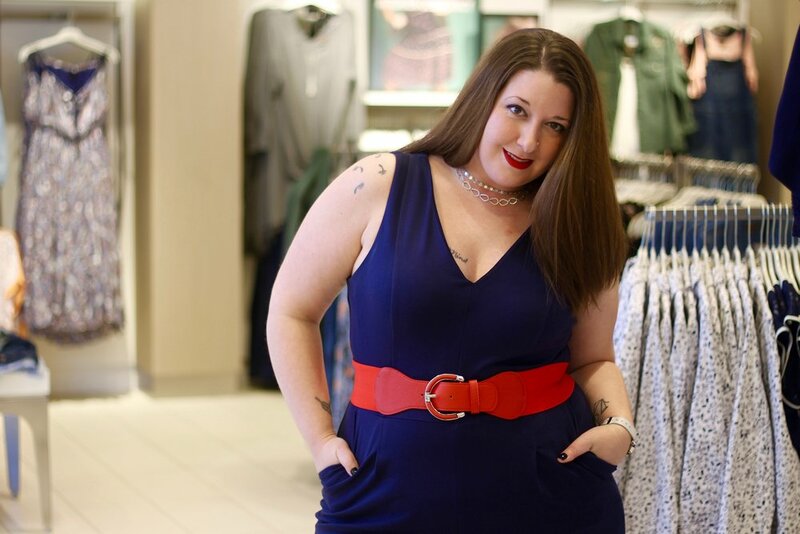 I would love to see how you style yours so please tag me in your images and use #mycurvesslay! I'd love to share your looks too! Huge thanks to Kimberly (@kimberlydawn2186) & Lynn (@lynnmariedd) for being a part of this post!